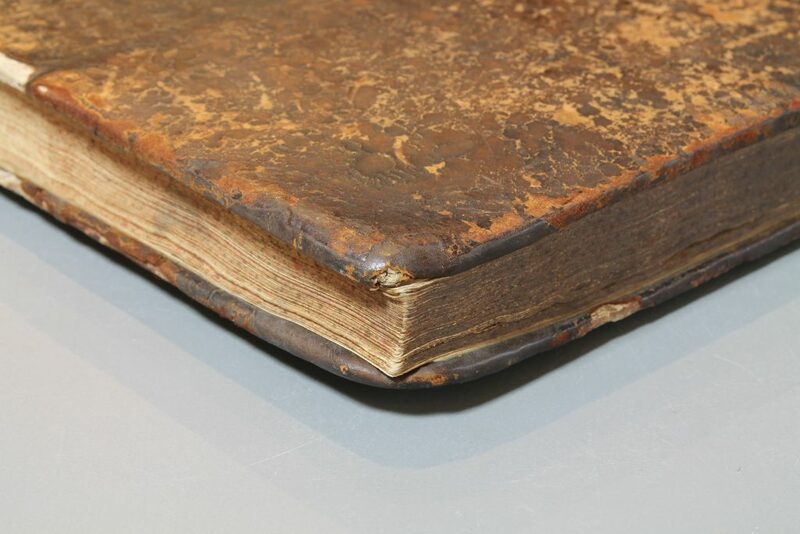 A mid 17th century in-board binding bound in pulp boards and covered in brown calf leather. 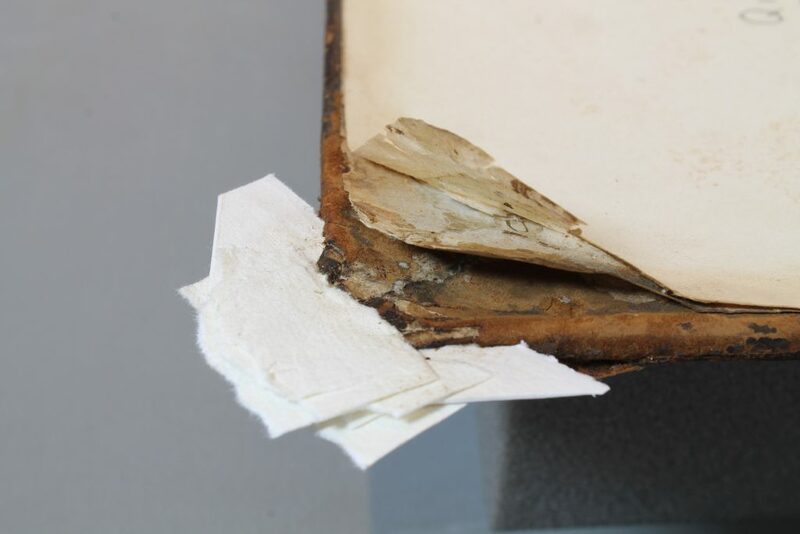 The book had been crudely repaired in the mid 20th century: it had been re-backed and the board corners were re-covered with new leather; however, no attempt was made to rebuild the missing tips of the worn pulp boards. The result is that the text-block was proud of the boards, and was vulnerable to damage. 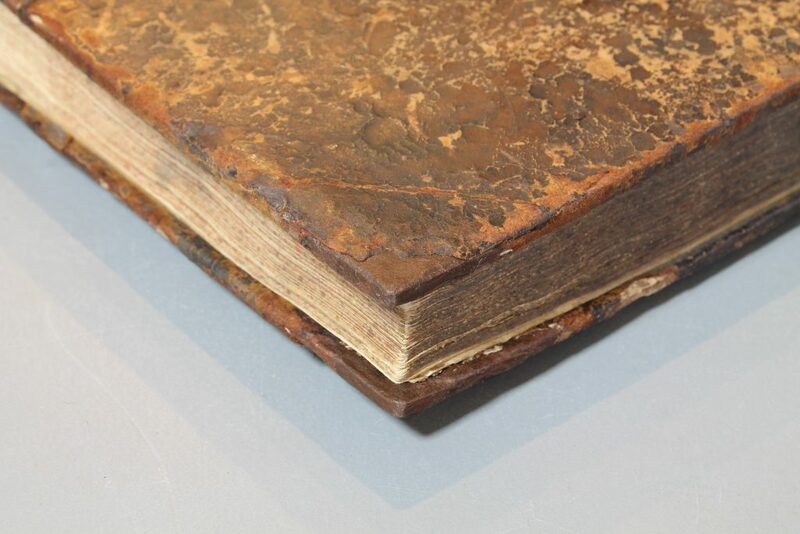 In addition, the 20th century repair leather was showing signs of acid decay under the grain layer. Fig. 1. 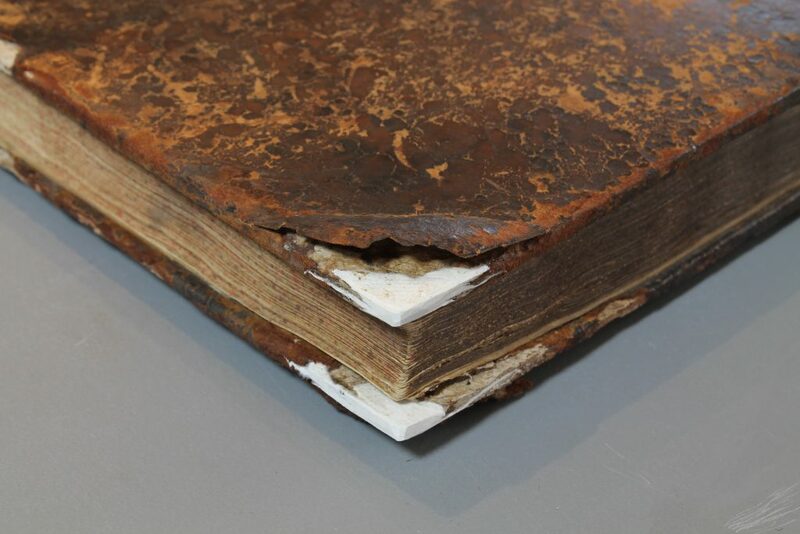 The paste-down and the original covering leather was carefully lifted with a sharp lifting knife. The 20th century repair leather was then lifted and discarded. To rebuild the missing corners of the paste board Khadi paper was chosen. Khadi paper is 100% cotton rag with a rough surface, gelatine sized, and pH neutral. It has good archival qualities, and is relatively soft and malleable (similar to the original paste board). Khadi paper also comes in a range of weights ranging up to 640 gsm. 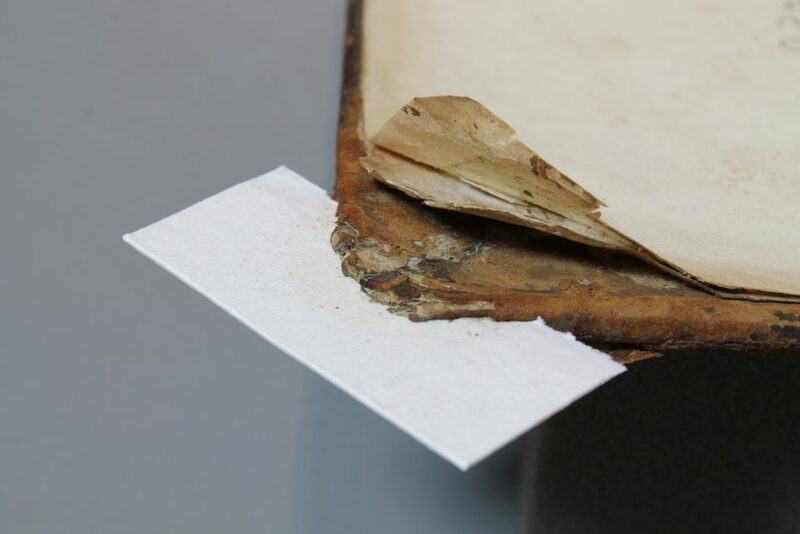 The corners of the paste boards were split, then pieces of thick (640gsm) paper were inserted and secured with wheat-starch paste. The lead edge of the paper was edge-pared to avoid a step. Fig. 2. The board corners were then lightly pressed and left to dry over night until completely dry. This formed a secure platform upon which the new corners could be built. Using a papier-mâché technique, the missing corner was then reconstructed by building up layers of torn strips of thin (210gsm) Khadi paper. Fig. 3. Once dry, the new oversized corners were cut to size and shaped with a sharp knife. Fig. 4. The new corners were then covered with handmade Japanese paper, which was toned beforehand with liquid acrylic inks to match the original covering leather. Fig. 5. Japanese paper was chosen for its strength, longevity, and ease of use. Finally, the original lifted leather was pasted back down into place.